At Cyborg's insistence, his dad performs the surgery allowing Vic to breathe underwater. This surgery will require the sacrifice of Victor's remaining lung; but Cyborg needs the operation to help the Justice League through this crisis. Even as he lays unconscious, Cyborg is downloading and processing the security feed from the U.S.S Mabus. He is looking to find out who sabotaged the missiles. This is what started the war. Folks in the news media are speculating that Aquaman is siding with Atlantis against the Justice League. Some in the media are suggesting that Aquaman planned this betrayal from the beginning, when he joined the team. This is of course complete rubbish. Aquaman would never betray the Justice League. At the Watchtower, Vulko accuses Dr. Shin of crimes against king Arthur of Atlantis. Their discussion gets rather hostile. Aquaman and Batman converse. They are at the bottom of the ocean; but Batman has a special suit to protect him from the massive water pressure and to regulate his oxygen level to avoid toxicity. Since they have been banished to the Dark Waters, Aquaman plans to get some bioluminescent fish, to provide a bit of light. But Batman has a better plan. He has sonar equipment, which he will use "see" his surroundings. Aquaman indicates that they are in the Mid-Atlantic Trench; and that this is where the man-eating creatures come from. This is an ancient Atlantean torture, getting eaten by vicious sea creatures. 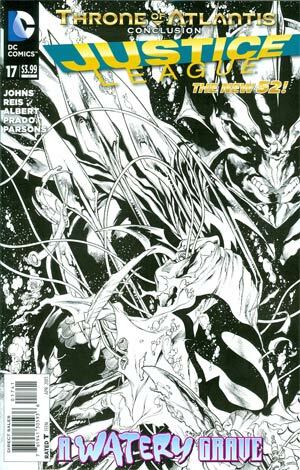 One of the creatures suddenly arrives and attacks Aquaman, who fights back and eliminates the threat using his trident. Aquaman says they need to grab Superman and Wonder Woman and get out of there. Aquaman speculates that maybe Orm was the one who triggered the missile strike. Aquaman had a very powerful scepter stolen. This scepter is so powerful it can sink an island. He says that if Orm has it and sinks Boston, millions will die. Several of the new Justice League recruits are battling the troops from Atlantis. We see Black Lightning, Hawkman, Vixen, Black Canary, Firestorm, and Element Woman in action. The fighting is fierce; this is war. Hawkman is probably the most aggressive and effective fighter. So Orm sets off an explosive charge that takes Hawkman out of the fight. Orm continues to proclaim that Atlantis will get its revenge on the surface world. Cyborg wakes from his operation and is back online. He is told that the new recruits are slowing Atlantis down, which is all Vic needs them to do. Cyborg tells Mera he has locked onto Batman's signal. Mera says she and Cyborg should go get the imprisoned Justice League members. Aquaman and Batman find some ancient Atlantean hieroglyphics in an undersea tunnel. There is a depiction of the powerful scepter that they discussed earlier. Using Batman's sonar to guide the way, Aquaman arrives at the chamber where Superman and Wonder Woman are imprisoned. There is an organic fluid that is causing paralysis in Superman and Wonder Woman, which is why those two powerful heroes were able to be captured. That fluid is produced in the Trench. Many of the man-eating creatures arrive and are intent on assaulting the comatose Superman. Aquaman intervenes to protect his friend, and battles many of the creatures. Cyborg and Mera arrive and help Aquaman battle the creatures. Aquaman and Mera open the pods containing Superman and Wonder Woman, who are in shock due to the water pressure and the chemical affecting them. Mera says they should recover momentarily. Cyborg tells the others that he brought in recruits to help in the emergency. Batman objects; and says that he especially has a problem with Hawkman. Aquaman speculates that Orm can control the creatures using the scepter. 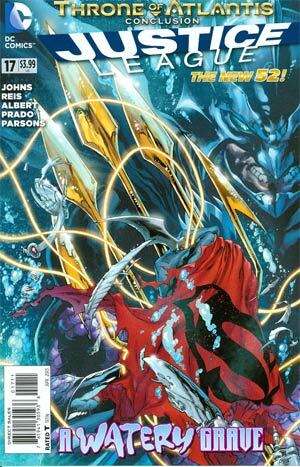 But momentarily, Aquaman states that Orm does not have the scepter. Cyborg has finished downloading and processing the security video from the U.S.S Mabus. Vulko and Dr. Shin argue loudly. Dr. Shin is no match for Vulko, who is much stronger. Vulko slaps him, and Dr. Shin goes down. Vulko says that when Arthur left Atlantis, they turned against Vulko and sent him into exile. But now Vulko says he will get revenge. Aquaman recalls his childhood at Amnesty Bay with his dad. He liked watching his dad work in the lighthouse, and admired his dad for protecting ships by warning them not to get too close. Arthur's dad constantly worried that citizens of Atlantis would come and take his boy away. He kept this a secret for a while, but told Arthur eventually. Young Arthur got very frightened once he heard this. At Watchtower, Dr. Shin is recovering from Vulko's attack as several of the Justice League members look on. Dr. Shin says that Vulko is the one who sabotaged the warship, sent the missiles to Atlantis, and thus started the war. Batman asks where Vulko is, and is told by Cyborg that Vulko is gone and that the teleporter log has been wiped clean. When Superman asks why Arthur's friend would want to start a war with Atlantis, Mera says that Vulko was exiled from Atlantis when Arthur left the throne; and now Vulko wants revenge. Mera's hypothesis is right on target; we heard Vulko say the same thing. Aquaman states that Vulko is using the Dead King's Scepter to release the man-eating creatures from the Trench and send them after the people of Atlantis. Aquaman begins to feel really guilty. He says he is responsible for the war because he put Orm in charge of Atlantis even though he knew about Orm's bitterness toward the surface world. The scene shifts and we see the new Justice League recruits (Black Lightning, Vixen, Black Canary, Firestorm, Element Woman, and Zatanna) in the waters around Boston battling Orm and his troops. The fighting is fierce; this is war. Orm is told by one of his soldiers that the flesh-eating creatures have left the Trench. Orm thinks the creatures are being controlled telepathically by his brother Arthur, who plans to use them against Atlantis. Hawkman recovers from his previous wounds. 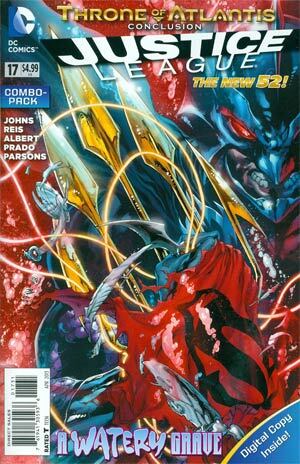 He pierces Orm's wrist and grabs his trident. Orm seems to shrug it off, saying his brother's allies are unfocused, ill-trained, and disorganized. Firestorm proves this to be so with a clumsy maneuver on the battlefield. He turns the water to steam, but this blinds and chokes his own teammates. Orm and the Atlantean troops are preparing the E-Devices that will sink Boston. But here comes the *REAL* Justice League (Superman, Batman, Wonder Woman, Cyborg and Aquaman, plus Mera) to put a stop to Orm's ruthless plan. Superman tells his friend Aquaman that he does not need to prove anything. But Aquaman disagrees, and goes one-on-one with his brother. They engage in hand-to-hand combat using their tridents. Cyborg has spotted the two bombs, and notifies Batman. Batman tells Cyborg to try to disable the bombs and to notify the reserves to meet Batman on the docks if they can disengage from the battle. As they battle, Orm and Aquaman discuss the situation. Orm commends this brother for escaping the Trench and commanding the flesh-eaters. (Of course we know that Orm is mistaken.) Aquaman reveals to his brother that it was Vulko who sabotaged the missiles which started the war. Batman meets with the reserves. He asks them to help find Vulko. Bloodthirsty Hawkman wants to know if Vulko should be brought in dead or alive. Orm does not believe what his brother just told him about Vulko. Aquaman wants Orm to command his troops to stand down, so that they can work together against the creatures from the Trench. Orm is defiant and derisive. He says he will press on with his war even if Vulko was responsible for the mishap with the missiles. Orm recalls his childhood; and how he was told stories of the terror the air-breathers from the surface world brought upon Atlantis. He remembers that he wept because he had a brother who was "trapped" in the surface world. He says he wanted to build up an army, so they could go to the surface and "rescue" Arthur, but Aquaman found Atlantis first. Orm says that Arthur has betrayed Atlantis by siding with the surface world. Orm gives the command to detonate the bombs, but somebody (Atom?) has disabled the first bomb; and Superman and Wonder Woman remove the second bomb. Orm is still determined to flood Boston, even without the two bombs. Mera, Zatanna and others act to thwart Orm's efforts. As Arthur and Orm continue to discuss the situation, Vulko holds the scepter and looks down from the roof of a skyscraper with a sneer. Aquaman lands a hard punch and smashes Orm's mask. He says that he never wanted the crown, but now must take it. He tells Orm to yield the throne, and Orm complies. Aquaman cries out to the troops of Atlantis that he is now their king. This action seems to satisfy Vulko, who immediately surrenders. Aquaman commands his troops to cease the battle with the surface world and focus on the real threat, the bloodthirsty creatures of the Trench. He says that the heroes from the surface world will stand with Atlantis against the Trench. Orm joins in the battle, saying Arthur is his king too. There are many of the creatures, and Superman asks if Aquaman can control them telepathically. Aquaman says he needs the Dead King's Scepter to do that; so they need to find Vulko. But Batman and the reserves have accomplished that. Vulko kneels before Aquaman, calls Arthur his king, and hands over the scepter. Vulko tells Arthur he did all this so that Arthur would take back the throne. Aquaman goes into a rage, because so many people drowned as a result of Vulko's actions. Aquaman lands a hard punch to Vulko's jaw, saying, "How could you betray me like this?" Vulko says he did this because he loves Atlantis and loves Arthur like a son. Using the scepter to magnify his telepathic powers, Aquaman commands the creatures of the Trench to return home. They comply. Aquaman commands the troops to arrest Vulko and take him back to Atlantis for trial. King Arthur says that Orm will remain with him rather than returning to Atlantis. Aquaman arrests Orm for the murders he committed during the floods. Orm protests, but Arthur remains firm. Orm is confined to Belle Reeve prison, awaiting trial. Aquaman tells Mera that he does not want to return to Atlantis; but he must in order to keep the peace. Aquaman asks Mera to accompany him back to Atlantis, but she cannot. Mera is heartbroken, and begs Arthur to reconsider. But he must go, and she must stay. Meanwhile, Amanda Waller tells Colonel Steve Trevor that a new team is needed. She throws some photos on a table, and they begin assembling the Justice League of America. Story - 5: I went the extra mile this time in order to tell the whole story and avoid ambiguity. Since the story hopped from Justice League #16 to Aquaman #16 to Justice League #17, I thought my synopsis should do the same as well, to avoid gaps. I thought this would add clarity to my review, and would particularly benefit those folks who have not been following along in Aquaman's book during this crossover event. This story is unusual in that there are so many sides to this conflict: Orm and his troops, Aquaman and Mera, the Justice League, the new Justice League recruits, the flesh-eaters from the Trench, and Vulko. Each side has their own perspective, agenda, and motivations. We learn more about Aquaman's past. Aquaman has fond memories of his childhood watching his dad work in the lighthouse. Aquaman grew up fearing that troops from Atlantis would take him away from the surface world that he loved. It is clear that Aquaman wants no part of the Throne of Atlantis, but feels he must take that step in order to keep the peace. Now that Aquaman has ascended to the throne, will he have to leave the Justice League? I hope not, because he adds depth and richness to the team. And will he ever get to see his wife? They both looked heartbroken once he made the decision to leave. Arthur's brother Orm was brainwashed as a child against the surface world. This shaped his attitude of hostility, and his warlike actions. Arthur and Orm come to this conflict from opposite directions. Vulko feels he is acting out of loyalty to Arthur, but his actions have started the war and caused many to drown during the floods. A twisted desire for revenge against Atlantis has caused Vulko to take drastic steps that have hurt many innocent victims. Aquaman feels betrayed by Vulko when he discovers that Vulko was the catalyst who started the war. We are initially misled about Vulko. When Aquaman says Vulko is like family, and when Vulko rescues Lois Lane from the flood, he appears to be heroic and altruistic. This is deliberate misdirection by Geoff Johns, to get us off the track. It is only later that we get a darker picture of Vulko. Another character who is at the center of this narrative, in my opinion, is Cyborg. Cyborg makes a huge sacrifice for the cause, by giving up his remaining lung. This step gives Cyborg additional abilities, but will have consequences. Cyborg already has expressed feelings of inadequacy; feeling he is more of a machine and less of a man. Will those feelings intensify when Cyborg's artificial lungs make a hushing sound as he travels along? I had some additional questions as I read the story. Will Aquaman get to keep the Dead King's Scepter. If it is powerful enough to sink Boston into the ocean or to augment Aquaman's telepathic powers so he can command the Trench, it is very powerful and very useful indeed. Are the new recruits still part of the Justice League? Or will Batman's objections cause their admission to be delayed until they can be vetted? I agree that Hawkman is too aggressive and bloodthirsty to belong in the Justice League; and that Firestorm is too inexperienced. All in all, this was a worthy end to an excellent story arc. Art - 4: The artwork is solid. Cover Art - 3: Orm wields his trident and looks menacing as we see remnants of the fallen heroes, including a cape, a magic lasso, and a batarang. Everything is underwater. This cover is average. 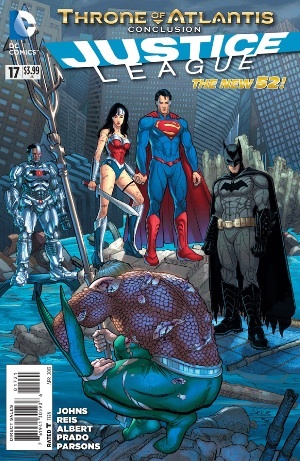 Cover Art (Variant Edition) - 2: Superman, Wonder Woman, Batman, and Cyborg look on as Aquaman kneels and does... something. Is Aquaman praying? Is he stretching and preparing for battle? Why is everybody looking at him?